Early Damiana Bitters or is something wrong here? Gary Beatty snagged this interesting Baja California Damiana Bitters with a label (pictured above) and wonders if it is a variant of the more common Damiana Bitters most of us are familiar with (pictured below). He also wonders about the authenticity of the label. His email to me is represented below. 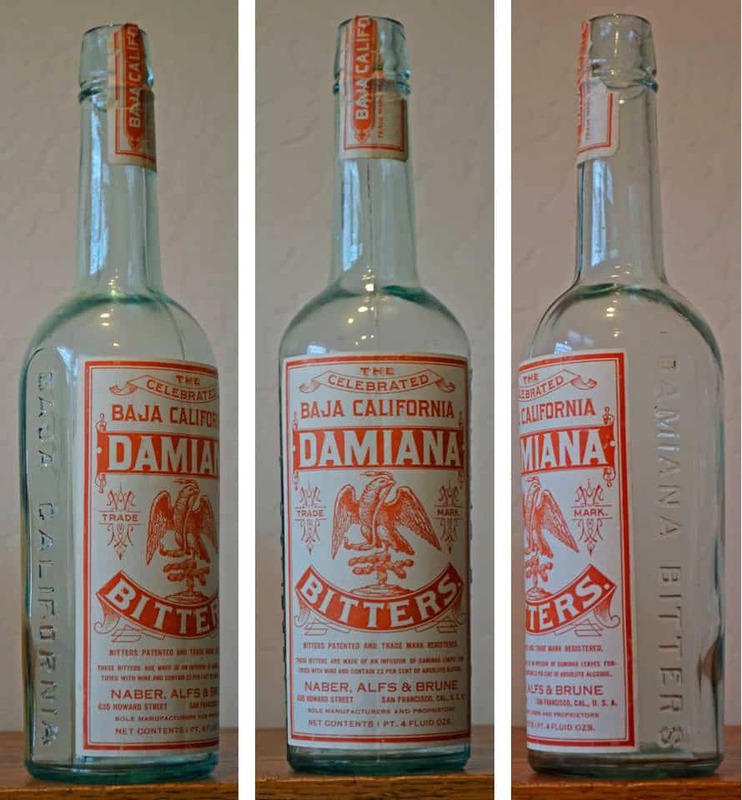 Here is a Damiana Bitters that closed on eBay last night. Look at that cool embossed star on the base. To me the label looks very much like it has been applied to another bottle. 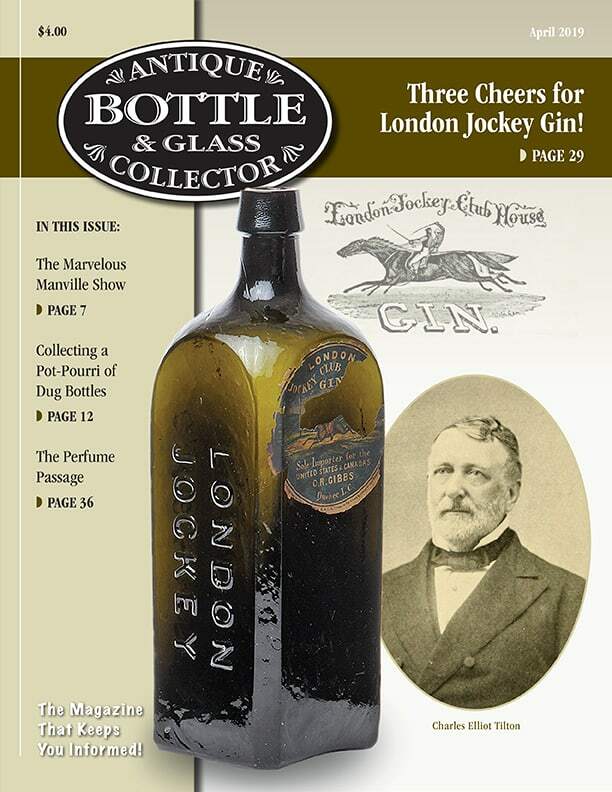 I was interested in the label though and like the “The New, Wonderful & Only Certain Aphrodisiac” copy. First I wanted to find out who Winder & Shearer were in San Francisco. 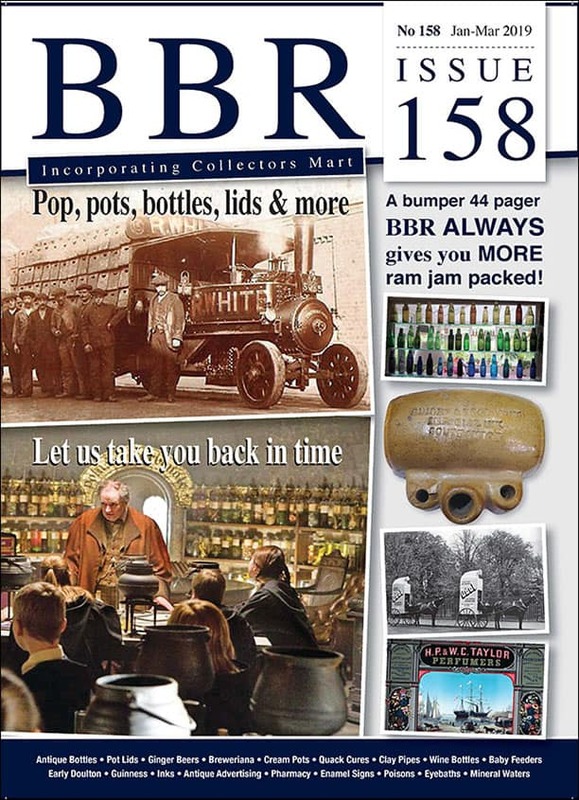 The label lists them as Sole Proprietors and Manufacturers. Usually you see the name Lewis Hess, Lips, Craigue & Company, Michel Levy or Naber, Alfs & Brune associated with the brand. 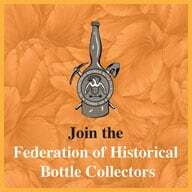 A search tells us that Winder and Shearer, in 1876, were the originators of the bitters that would survive two or three decades is various forms with various proprietors across the United States all the way to New York. Actually you can even buy Damiana Bitters today as you can see an example to the left. I talked to Gary last night and said he probably still has an interesting piece. He paid less than $10 so that’s good. I really need to find the original art that this label came from. 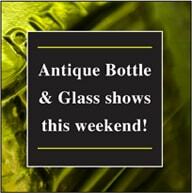 Further below you will see the paper added to another rectangular form of bottle. If you look close, you can read “This is an Authentic Reproduction” on the bottom of the label. That’s kinda funny isn’t it? Looks like someone took scissors or an X-acto knife and cut the graphics area into a tall oval. Notice that the snake on top and the bottom rule are cut off. 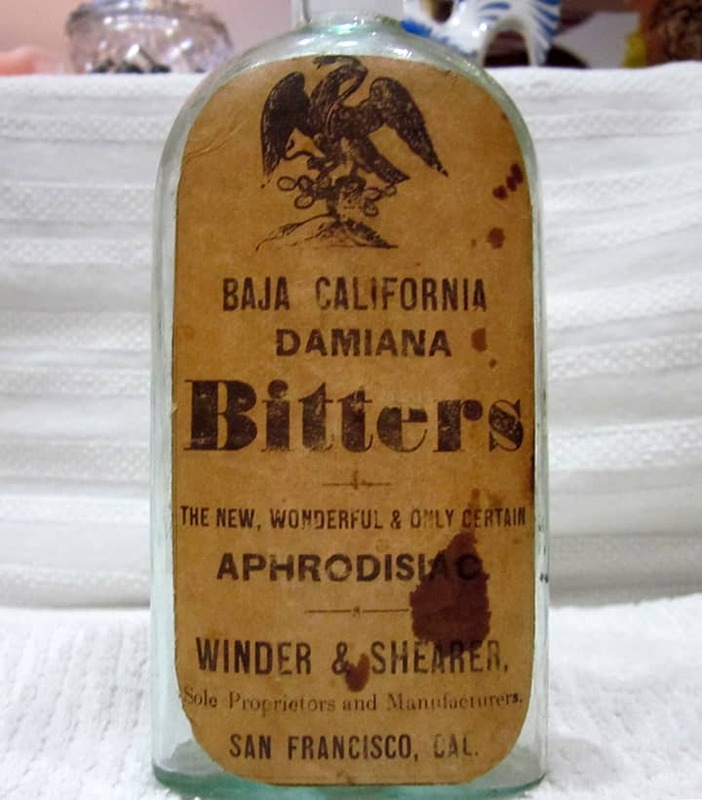 Here is another example where someone has put the same art on another bottle and sold on eBay as “Auténtica reproducción Winder & rozadora Bitters AFRODISIACO Botella de San Francisco” *Note that “This is an authentic Reproduction” is on the bottom of the label. Yet an another example in a sexier setting. Same label on the bottle type as above. No need to cut label with a rectangular face. 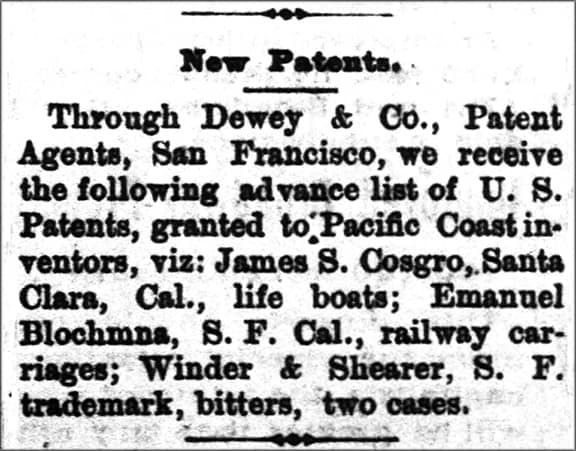 We can confirm that William A. Winder and Melville M. Shearer applied and received a patent in San Diego and San Francisco for their bitters on 09 May 1876. 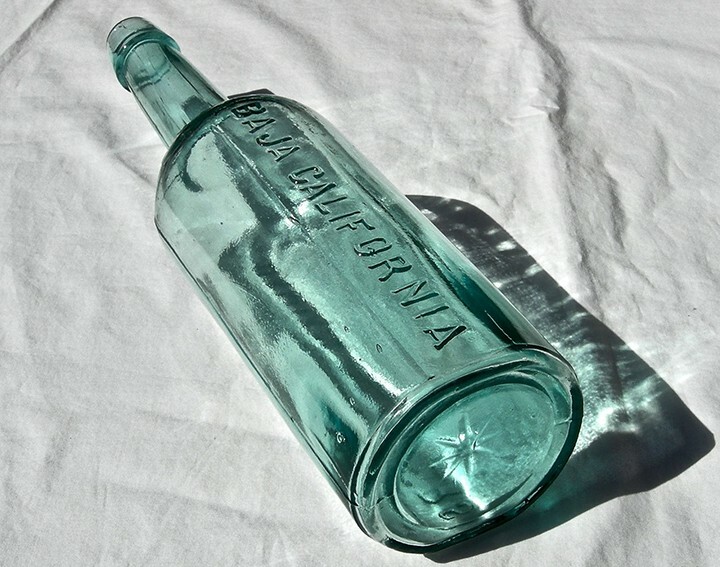 This was the origins of the Baja California Damiana Bitters. 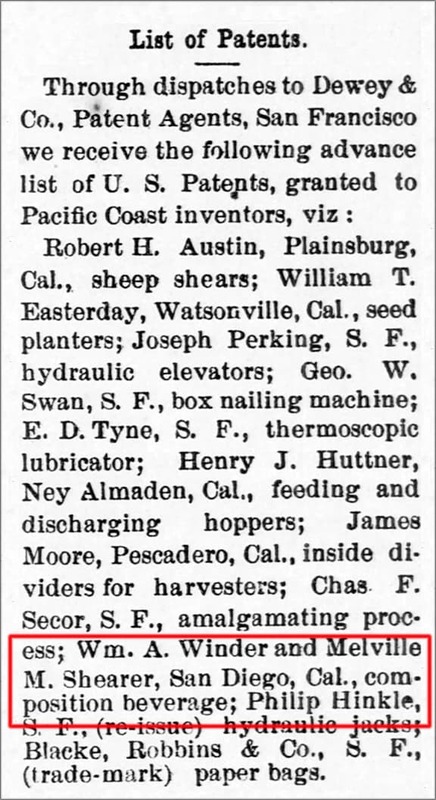 Notices were filed in various newspapers in California so these guys must have had some big plans. Winder and Shearer’s path probably crossed in the military, most likely in San Diego or the Presidio in San Francisco. Maybe it was Fort Alcatraz. 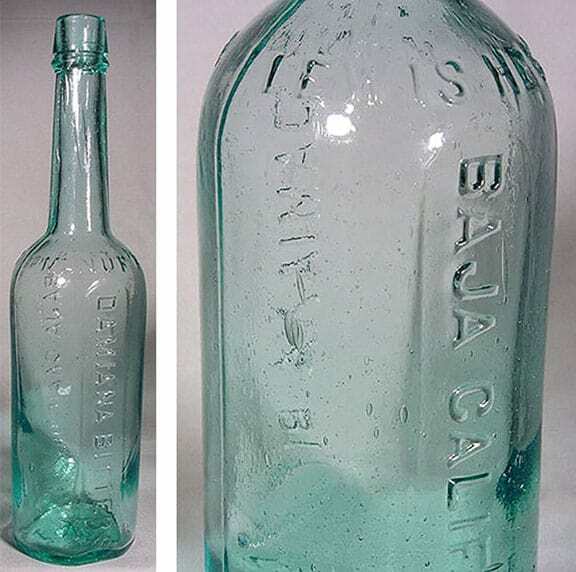 They would file a patent in 1876 for their Baja California Damiana Bitters and in short order, sell out and move on. Captain William A. Winder was born on September 1823 and was a U.S. Army Commanding Officer of Fort Alcatraz (1861–64). A native of Maryland, he served in the Army for eighteen years, having been promoted to lieutenant in the Mexican–American War, serving continuously until 1866. He was appointed second lieutenant, Third Artillery, March 24, 1848; first lieutenant, Third Artillery, August 22, 1853; and captain, Third Artillery, May 14, 1861. Dr. Winder was the son of General William Henry Winder who was “one of Baltimore’s brilliant lights.” and one of the most eminent lawyers in the city. At the time of his death Gen. Winder had the largest practice of any man at the bar in Baltimore, and one of the largest in the United States Supreme Court. Gen. William Henry Winder and Gertrude, his wife, had ten children. Of these, five died in infancy. Those who gained maturity were John Henry Winder, born Feb. 21. 1800. William Henry Winder, born 1807, Charles Henry Winder, born 1818, Gertrude Winder, Aurelia Winder. William Henry Winder and Gertrude Winder never married. John Henry Winder, son of Gen. William Henry Winder, and Gertrude, his wife, was born in Somerset County in 1800. He graduated at West Point; entered the military; resigned in 1861; entered the Confederate States army as Brigadier General and died at Florence, South Carolina on February 6, 1865. He was twice married. First wife. Elizabeth Shepherd; second wife. Caroline Cox. Dr. Melville MvVitty Shearer was born on 22 September 1842 in Savannah, Ohio. 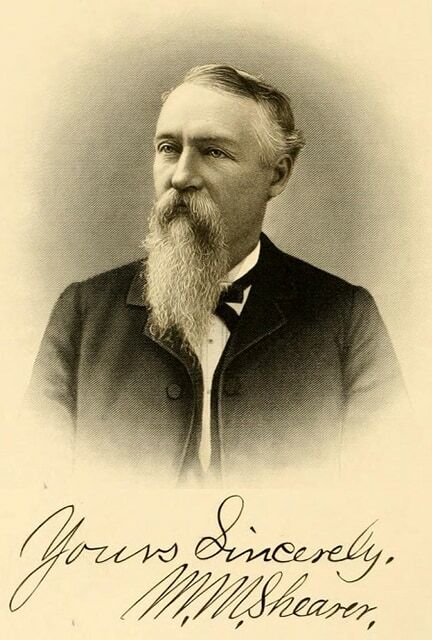 He graduated from the Medical Department of Iowa University in 1863 and served in the 48th Illinois Volunteer Infantry, ranked as Major of Cavalry and made the famous “March to the Sea” under General Sherman. He also served for 8 years with Generals Miles, Custer, Oaks and Ward and spent two years at the Presidio and then came to San Francisco 35 years ago. Dr. Shearer was a Knight Templar, and was for several years a county physician. He died on 28 May 1905 and is buried in the Santa Rosa (California) Rural Cemetery. 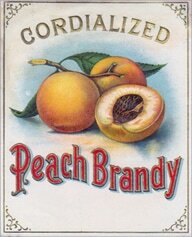 William A. Winder and Melville M. Shearer apply for a patent in San Diego for a composition beverage. 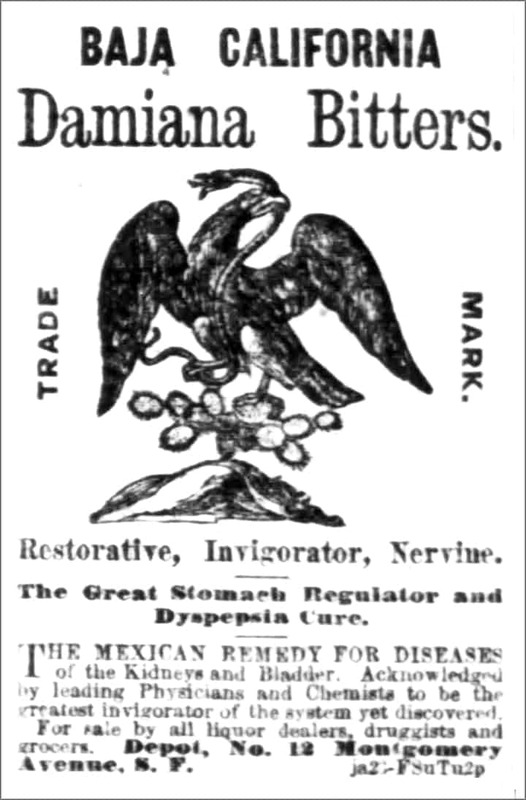 Probably the origins of the Baja Damiana Bitters. – The Arizonan Sentinel, Saturday, August 19, 1876. 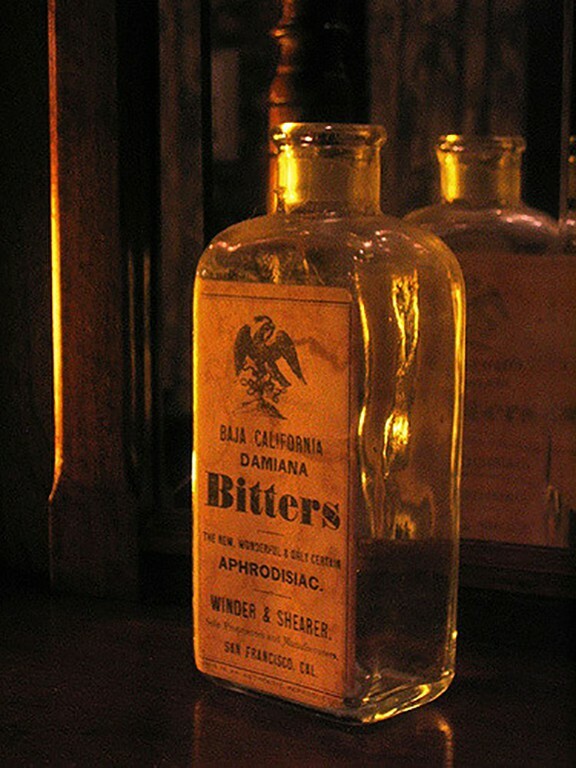 Damiana Bitters – Lips, Craigue & Co., Agents, Los Angeles, Cal. – Los Angeles Herald, Wednesday, March 19, 1879. 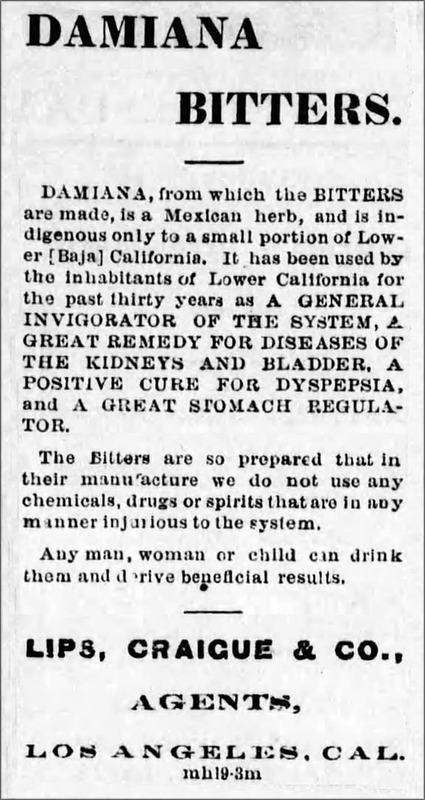 Damiana Bitters transferred to the house of Michael Levy from Lips, Craigue & Co. – Los Angeles Herald Saturday, March 22, 1879. [Bruce Silva] Ferd; Thought that the following may be of interest in light of current threads. It’s an interesting bottle from several standpoints. It’s late; the darn side mold seam nearly runs through the lip. The address dates it to ca. early 1911, when the Alfs brothers took over control of Naber, Alfs and Brune, and moved the concern over to Howard St. See the following chronology of addresses and ownership. Here’s the S. F. directory listing for January 1910 below. William Alfs was sole proprietor at this time. Again, Mission St. In 1911, William’s brother Carl joined him as a partner this year. 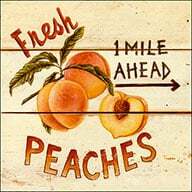 By then, they had moved to Howard St.; the address on the label. 1912 directory clip below; first year that they moved next door from 631 St. Howard to their final location at 635 Howard St. The last listing for the firm is present in the 1917 directory. William Alfs had returned to sole proprietor status. And so, the window of time for this label is ca. 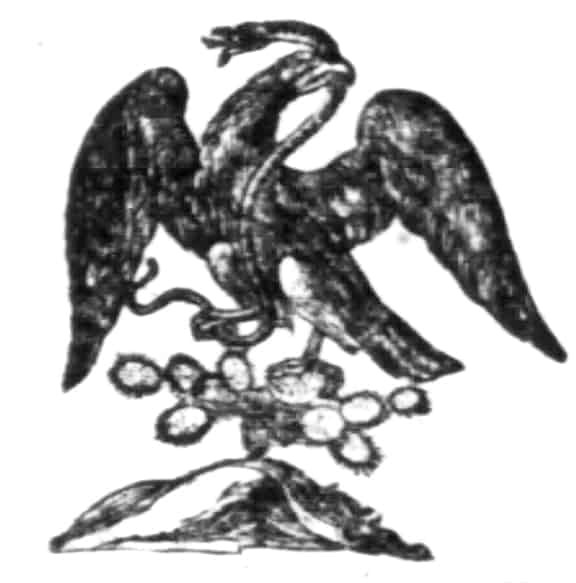 1911 – 1917. 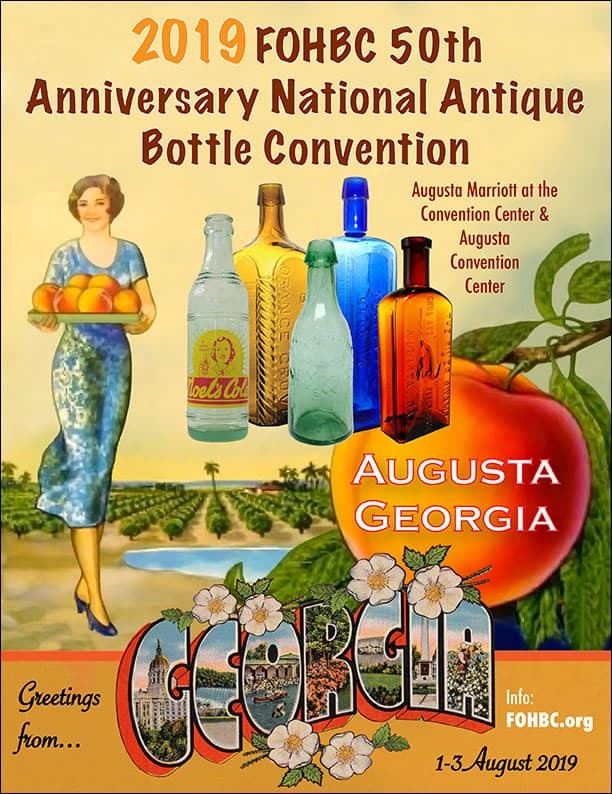 I’d most probably date this bottle to the earlier part of this time period, as ABM bottle production was in full swing by the mid teens. Good thing it’s so late as the label held up. 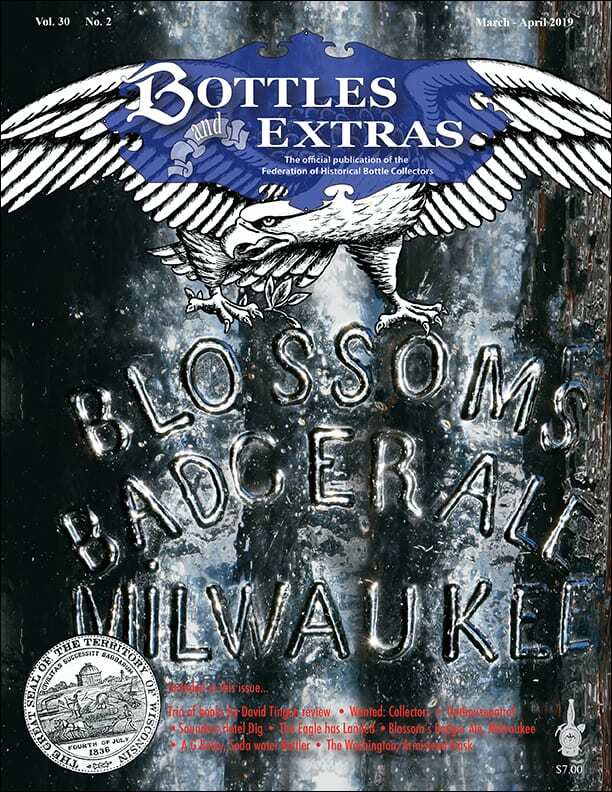 Bottle is attic perfect, body label is pretty good, just a trace of wear around the edges. And it’s nice to see one with at least a partial neck label. Something I’d never run across before, even in the books. 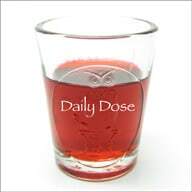 1876: William A Winder and Melville M. Shearer apply for a patent in San Diego for a composition beverage. Probably Baja Damiana Bitters. – The Arizonan Sentinel, Saturday, August 19, 1876. 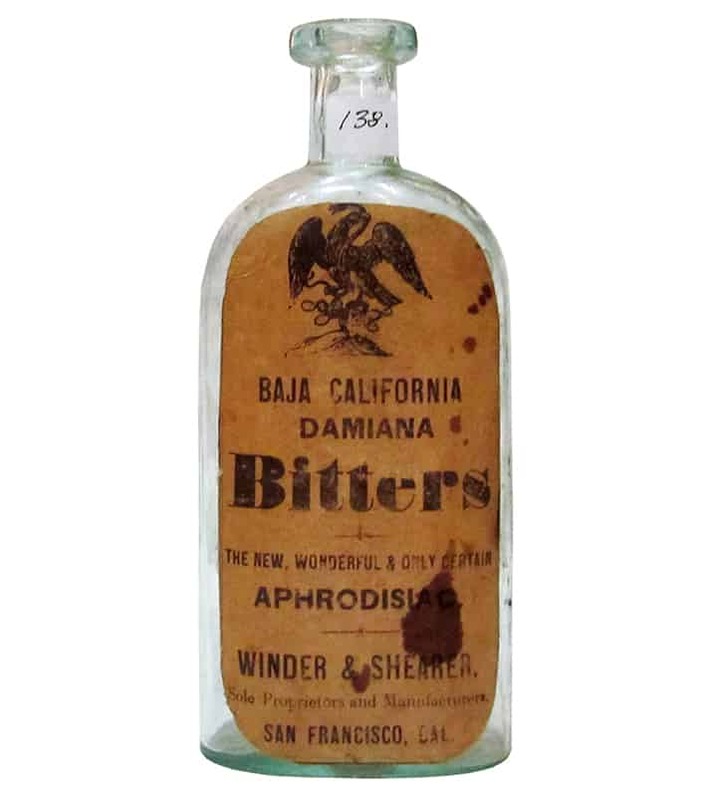 1879: Damiana Bitters – Lips, Craigue & Co., Agents, Los Angeles, Cal. – Los Angeles Herald, Wednesday, March 19, 1879. 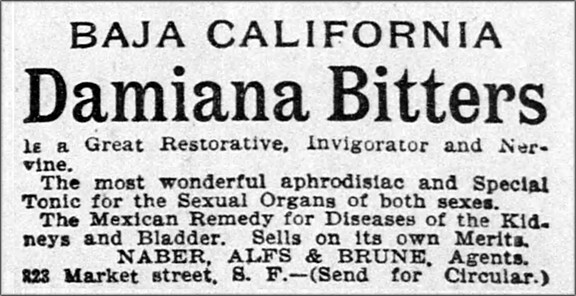 1879: Damiana Bitters transferred to the house of Michael Levy from Lips, Craigue & Co. – Los Angeles Herald, Saturday, March 22, 1879. This entry was posted in Advertising, Bitters, History, Medicines & Cures, Questions, Scams & Frauds and tagged Alcatraz, Alfs, Aphrodisiac, Baja, bitters, Bruce Silva, Brune, california, Damiana, Gary Beatty, label, Melville M. Shearer, Naber, Presidio, san diego, San Francisco, William A. Winder, Winder & Shearer. Bookmark the permalink. 1 Response to Early Damiana Bitters or is something wrong here?